While my sister is enjoying global warming with 60 degree weather in Virginia, the Berkeley chill has put a serious dent in my sheng pu-erh drinking. I had planned many times in my mind to brew up some of the mystery beengs Caroline brought, but I just wimped out with a cup of toasty feel good dian hong just like I did yesterday, and the day before that. It's true. If there had to be only one tea in the world, there's only Yunnan gold for me. The more hardships I eat, the more I value comfort over complexity. I am always a sucker for dian hong's malty maple roundedness which makes me feel all is right with the world even if it's only a cupful so. 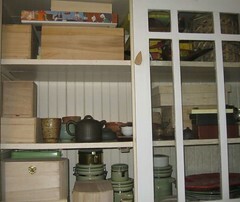 After a mess of exploding cakes with tearing rice paper covers, I've cracked down with basswood boxes. Perhaps this significantly detracts ageability by reducing the humidity but I open the boxes frequently enough.
" The flower tea cake can only keep for a maximum time of about 5 years. Due to its richness in pollen and other flower components, its fermentation process is faster than of tea leaves." Just a gimmick or does it really enhance the tea. I'm on the gimmick side of the fence although the idea itself is lovely. Caroline brought me back a hefty box of tea from Beijing Chado and Meliandao, more than 16 beengs of which I have only been slowly and pleasurably trying out the cakes. These are douji cakes she rightly chose along with a obligatory stack of Yinji 6 FTM which is a regret. But gifts of pu-erh are always accepted with gratitude. It is very difficult to get any information on vintages. Can anyone even make a generalization that 2007 was not a good year because of the hyper-inflation in maocha? Truth be told, I love sniffing my cakes of pu-erh before going to sleep more than drinking them. The better Xiaguans are the perfect lullaby to my sleepy nose. As it is wiser to spend money on tea than on tea wares, I have not gone crazy with yixing follies and have vowed to make do with what was already in my china cabinet. I never liked the gaiwan- white porcelain is too clinical for me. I feel too burdened by using a yixing pot as my style is too much wrongfu. I love my rustic Korean teapots best. This little wee teapot on the left from Insadong is perfect for brewing tiny amounts so I can have several sessions of pu-erh. 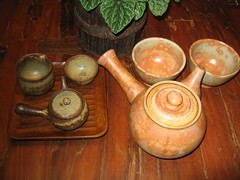 The giant teapot on the right is made in the traditional Korean way with firewood and potter's wheel. If you remember M&J(now Royal Tea Garden) sent me a Canger tuocha with a bite taken out of it, I was upset but Peter e-mailed me an apology and said they would give me a new next time I ordered. I also see on pu-erh.net that Mike doesn't do business with them anymore due to bad experiences. Should young shengs should be drunk regularly? I've read on LJ of older drinkers(ahem) not taking kindly -stomach wise- to too much young sheng. Vendors keep pushing new cakes as "excellent to drink now". Raw pu-erh is reputed to have a cooling effect. However I've had young shengs with so much qi that my hands and head would heat up after a few cups. After waiting a month for my teas to arrive from the slow boat from China, I was crestfallen to receive a box full of dreadfully moldy teas. The original box must have gotten wet and exploded. 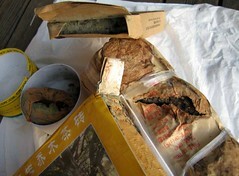 USPS threw the wet cakes into a black trash bag giving rise to a fantastic growth of green mold. Scott(YSLLC) says he doesn't pack beengs in airtight plastic as they can also mold inside them in the month of transport. Even if I received a refund, it's always sad to see good tea gone to compost. "This is Xia Guan’s newest old idea (let me explain). Many years ago Xia Guan (in the 50’s) used iron to press the teacakes it was an idea to improve the productivity rate by using a machine to press the cakes. After the results Xia Guan was not impressed with the teas result they said using the iron instead of the a wooden press by hand made the tea packed to tight and did not allow it to age properly. They stopped making the tea with the iron press and went back to the wooden press. Many years later they realized that the tea even though slower to age in this way turned out better then wooden pressed cakes. Years later they refurbished the press and made a limited amount of Iron cakes. A top grade limited Iron pressed cake is what you get that will only get improve with age." Xia Guan cakes are painfully tight and require the utmost kkung kkung power* to pry off even a tiny amount of leaves. Does this mean tightly compressed tea ages better or is this nonsense marketing fluff to justify modernization and price cutting. Giant factories could not crank out the volume that they do in the old manner of stone pressings. *Kkung kkung. Koreans emote these sounds when struggling over anything physical. What pu-erh will age well? Cut and pasted from teamasters.blogspot.com with my comments and questions. - Under the sun: this is the standard traditional technique. Such pu-erh has then the best potential to age well if the drying was well done. - Frying the leaves on a big wok: this gives the leaves a smoky smell. This smell will gradually disappear over time. While not as good as the sun, for aging it shouldn't have such a big impact. - Baking the leaves in an oven. 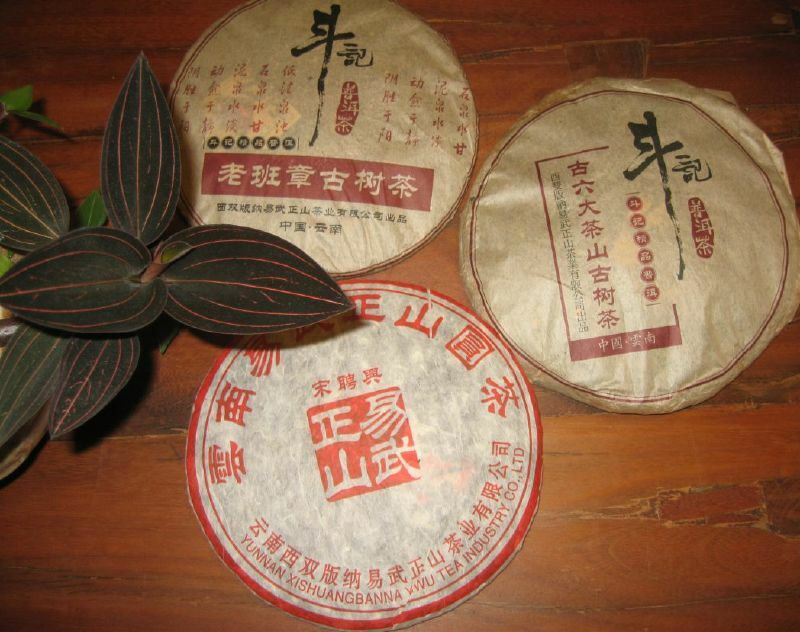 This technique doesn't give the pu-er the smoky smell, but it destroys some of its aging properties. It makes for a very fragrant young pu-er, but this kind of pu-er will not improve, just decline over time, like lightly fermented oolong. To recognize such pu-erh, watch for a more reddish brew." Does this mean Xiaguan is baked? Drats. Is my cigarette beeng a fried cake? I've read you want strength and smoke in a cake to age well. The strength is not indicated by a knock out astringent flavor but something of the cha qi present in my HLH Banzhang. There is a fad in the current marketplace to sell very fragrant (baked) pu-erh. Because of this, some are even producing pu-ers with white tips only or a very large numbers of white tips. This is especially typical of plantation pu-er, since their leaves are regularly harvested in their young stage. I have also seen some cakes with pu-er flowers on top of them. The problem is that such leaves contain too much water and this creates acidity over time." I love them white cakes for easy enjoyment but since they won't age well, I had better drink 'em up this decade. The ratio of white tips for wild pu-er should be lower than for plantation pu-er. But they should not have disappeared completely either, otherwise it may be that the cake is made up of only old leaves. The very best pu-erh I have encountered are wild. They have the strength and potential for the longest and best aging. And if you like them young, then you should love them as they grow old." What is the true meaning of strength? Is that fortitude of brew to last beyond the 10 brews? Is it fortitude of flavor? Or the cha qi? Could there be tea with extra punch cha qi but can last only a few brews? Why is there more questions than answers in the pursuit of pu-erh.